Although no national water rights system exists in the United States, recognition of the continuity of surface water hydrology in the form of the Colorado River across many western states led to the development of the Colorado River Compact (45 Stat. 1057) in 1922. This compact forms an overarching background to decisions that impact surface water flows in western "headwater" states where flow originates. In the early 1900s, water rights legislation was confusing and conflicts arose among the Colorado River states (see figure below). The root cause of these conflicts is the hy-drologic reality that, although roughly 90 percent of the river's flow originates in the upper basin states of Colorado, New Mexico, Utah and Wyoming, much of the demand for the river's water emanates from the lower basin states of Arizona, California and Nevada (NRC, 2007). States claimed exclusive authority to regulate appropriation of stream water within their borders and the federal government claimed jurisdiction over water in interstate streams (Goslin, 1978). California, Nevada, and Arizona were proposing to store water in their states to offset seasonal flow variability and drought. They sought federal financing to create a comprehensive basin-wide development that would permit optimum use of the lower Colorado River. Colorado, Utah, Wyoming, and New Mexico officials argued that, without protective guarantees, the ability to use water in the future would be prevented. Therefore, establishing an agreement between the seven basin states regarding allocation of the Colorado River's waters was determined to be a necessity. In 1922, the Colorado River Compact (45 Stat. 1057) was signed. The compact instituted the following: (1) annual beneficial consumptive use of 7.5 million acre-feet of water apportioned to each sub-basin with the lower basin granted the right to use another million acre-feet annually if it is available, and (2) recognition of the rights of Mexico to use water with each basin designated to provide water for one-half of any deficiency that might occur in any amount granted to Mexico by future international treaty. The upper division states were not to cause the flow of the Colorado River at Lee's Ferry to be less than 75 million acre-feet in any period of ten consecutive years (Goslin, 1978). The compact cleared the way for federally funded, water-project development in the lower states, while allowing the upper states to develop at a slower pace without losing their water use rights. Since the 1890s, when direct stream flow measurements were made on the river, "the flow estimates on which allocations were negotiated in the 1920s were based upon data drawn from a relatively short and very wet period, and thus turned out to be overly optimistic" (NRC, 2007: 28). In fact, the gauge record shows that the 1905-1922 period had the highest annual flow volume of the 20 th century, averaging 16.1 million acre-feet at Lee's Ferry. The Rio Grande, Colorado and Tijuana Treaty of 1944 between the United States and Mexico (59 Stat. 1219, T.S. 994) codified obligations of the United States to deliver water from the Colorado River to Mexico and guaranteed that the United States would deliver to Mexico 1.5 million acre-feet annually of the "waters of the Colorado River, from any and all sources" (IBCW, 1944).1 The treaty further provided that Mexico shall not acquire any right to water in excess of that amount thus preventing future Mexican demands for water as their agricultural water demands grew. The guaranteed 1.5 million acre-feet annual water delivery to Mexico was subject to reduction in the event of shortages or drought upstream in the U.S. portion of the basin. This treaty did not address water quality levels for the Colorado River water entering Mexico. In 1949, the Upper Colorado River Basin Compact (63 Stat. 31) was signed, which apportioned water rights among the states with land in the upper basin. This compact details the rules and regulations for water-use curtailment during years when necessary to meet delivery requirements to the lower basin states under the Colorado River Compact. The compact specifies that the amount of water delivered at Lee's Ferry be "measured by the inflow-outflow method in terms of man-made depletions of the virgin flow" at that location (Goslin, 1978).2 This compact also outlines agreements between member states (Colorado, Utah, Wyoming, and New Mexico) on the use of interstate stream water. Although technically part of the lower basin, a small portion of Arizona resides in the upper basin. That portion of Arizona was apportioned a fixed quantity of 50,000 acre-feet per year. The remaining water was divided as follows: Colorado with 51.75 percent, Utah with 23 percent, Wyoming with 14 percent, and New Mexico with 11.25 percent. !See waterplan.state.wy.us/BAG/green/briefbook/lor/lor-7.html (accessed March 31, 2010). 2See Article VI of the Colorado River Compact at waterplan.state.wy.us/plan/green/techmemos/compacts.html (accessed March 31, 2010). 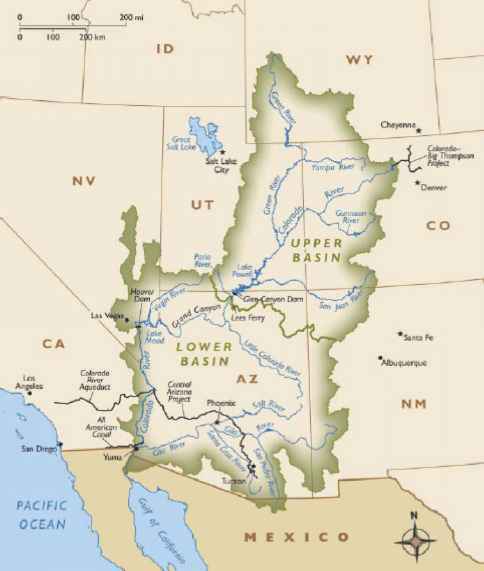 FIGURE E.l Map of the Colorado River system includes upper and lower basins. 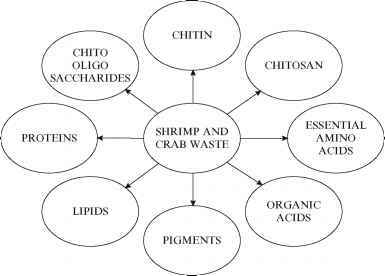 SOURCE: © International Mapping Associates. Goslin, I.V. 1978. Colorado River Development. In Values and choices in the development of the Colorado River Basin, eds. D.F. Peterson and A.B. Crawford, Tucson, AZ: University of Arizona Press, pp. 18-60. IBWC (International Boundary & Water Commission). 1944. Utilization of Waters of the Colorado and Tijuana Rivers and of the Rio Grande: Treaty between the United States of America and Mexico. February 3. Washington, DC: United States Government Printing Office. Available at www.ibwc.state.gov/Files/1944Treaty.pdf (accessed March 31, 2010). NRC (National Research Council). 2007. Colorado River Basin Water Management: Evaluating and Adjusting to Hydro-climatic Variability. Washington, DC: The National Academies Press.